By 1993, Daniel Day-Lewis had cemented his reputation as one of the foremost young British talents in cinema. The method acting for which he had acquired the interest of the critics (and the consternation of the film crew) in Jim Sheridanâ€™s My Left Foot was deployed yet again in their collaboration on the film adaptation of Gerry Conlonâ€™s autobiography Proved Innocent: The Story of Gerry Conlon of the Guildford Four. The film that resulted, In the Name of the Father (1993), is this weekâ€™s recommendation. The film front loads the explosive action: in the opening scenes we watch the bombing of a pub in Guildford that we later learn kills five and wounds many more; back in Belfast a few days earlier, an upstart young Gerry (played by Day-Lewis) accidentally ignites an overblown military response by the British Armed Forces in his Belfast neighborhood after heâ€™s caught stripping roof materials with his friend Paul. 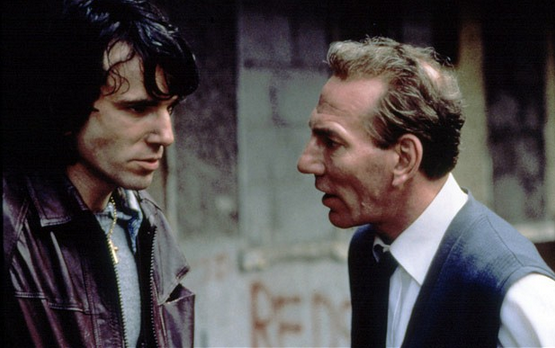 To secure Gerryâ€™s safety, his father Giuseppe (played by Pete Postlethwaite) sends Conlon the lesser to London, whereupon Gerry and Paul waste no time getting into mischief. But it’s out of the frying pan and into the fire, as Conlon actually has a rather unhappy knack for stepping into sensitive and highly threatening situations. The wider political climate, fraught with tension as the Troubles were reaching (one of) their peak(s), has just seen the passage of the Prevention of Terrorism Act that permits â€“ among other things â€“ the detention of terrorist suspects for up to seven days. Conlon becomes a suspect in the Guildford bombing and is tortured by the cops for days until they extract a fabricated confession from him that incriminates himself, his travel buddy Paul, and two other friends. In a wretched turn of events, even Gerry’s father and aunt are included in the conspiracy. 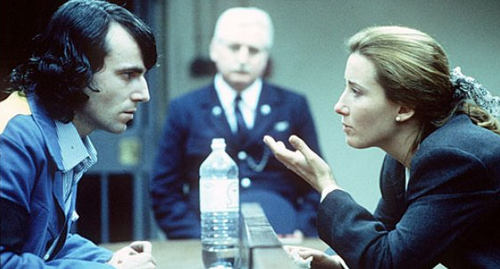 From that point forward, the drama shifts gears to a crusade for the exoneration of those convicted for the Guildford bombing â€“ a crusade prosecuted by the resolute Giuseppe and the lawyer Gareth Pierce (played by Emma Thompson). Giuseppe and Peirce hope to recruit Gerry to the cause by rousing him from apathy before it’s too late. In a film dominated by male spaces, all of which lack either determination, a sense of justice, or competence, Peirce brings a refreshing blend of all three. Although the physically demanding preparatory rituals Day-Lewis used in My Left Foot werenâ€™t required for In the Name of the Father, he was no less obsessive in getting into character. He stayed awake for days and starved himself before permitting filming to proceed in the interrogation scenes, and his desperation shows through. Even the weariness of being in prison for fifteen years comes across in his appearance, right down to the facial features. Itâ€™s not Linklaterâ€™s Boyhood, but Day-Lewis looks like he’s visibly aged by the end of the film. While thereâ€™s no question that Postlethwaite is outstanding as Conlon the elder, the added value of his character to the overall plot (beyond simply providing added grist to the suffering mill at the heart of the miscarriage of justice trope) becomes clear only as we approach the filmâ€™s conclusion. The father-son dynamic sharpens the sadness in the beginning of the film, but Giuseppeâ€™s most significant contribution is as a foil for Gerryâ€™s character development. At various points, Gerry spurns all three of the filmâ€™s elder male leads (Gerryâ€™s father, the righteous Giuseppe; Gerryâ€™s one-time idol, the self-confident IRA soldier McAndrew; and Gerryâ€™s nemesis, the crooked cop Dixon). Eventually, Gerry has to pick what direction his embitterment will turn him toward, and itâ€™s this complexity â€“ combined with the impressive performances â€“ that elevates In the Name of the Father above your garden variety miscarriage of justice movie. Indeed, throughout the film there are fragments of more subtle imagery and nuance than the traditional â€˜wrongful convictionâ€™ genre would suggest: in prison, Conlon dulls his nerves to the indignity of his incarceration by taking acid smuggled in on pieces of a jigsaw puzzle of, you guessed it, the British Empire. As Conlonâ€™s undeserved time in prison ticks by, the fabric of the Empire itself is gradually chipped away. The religious allegory one expects from the filmâ€™s title is mercifully never over-played, even as the themes of redemption and forgiveness permeate the story. Watch it, and you’ll get a sense of how good a film has to be to make a soundtrack that includes Bonoâ€™s music tolerable. What a superb choice and also an engaging perspective on the film. I love this movie, despite how sad it was, as a father-son story. There are so, so many movies where the noble, sensitive son tries hard to make an emotional connection with his disappointing father. This film is one of very few (The Weather Man is another) where the pattern is reversed, and the two actors handle it beautifully. Good point — another film that comes to mind that reverses the dynamic as you describe is John Singleton's Boyz n the Hood (1991).